After Yahoo Acquires Summly, Is Buying Math The Next Tech Bubble? : All Tech Considered Yahoo recently bought Summly, a news-summarizing app, for $30 million. But the company is ditching the app and only keeping the small team and the algorithm that drive it. So could this signal a change in companies buying fewer actual products and services and instead taking gambles on algorithms? Nick d'Aloisio displays his mobile application Summly, which Yahoo recently purchased for a reported $30 million. But the Internet company is killing the app and integrating the algorithm that drives it into its own technology. 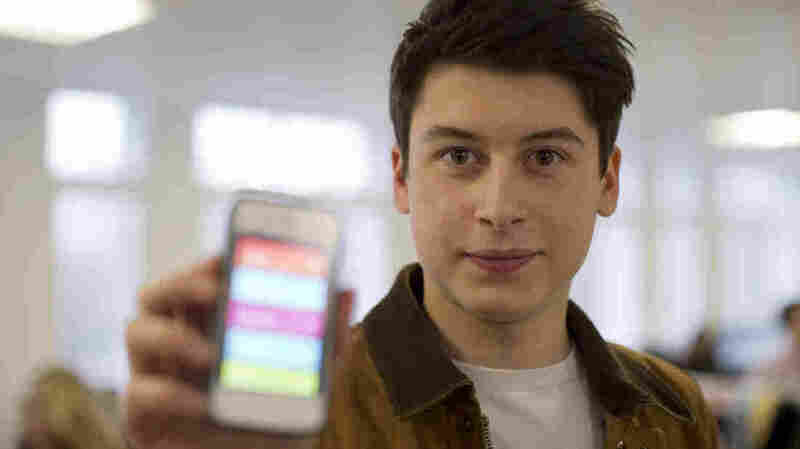 The news of Yahoo's purchase of Summly, the news-summarizing app created by 17-year-old British wunderkind Nick D'Aloisio, rippled through the news world on Tuesday. The acquisition, while notable for going to an entrepreneur so young, is hardly the largest or most surprising. The app had millions of downloads after its November release, but it had no real monetization strategy. And unlike, say, Facebook buying Instagram and leaving it intact, Yahoo said it is killing the app (in fact it is already gone from the iOS App Store); so Yahoo isn't buying an audience or a user base, either. What the Internet company appears to be taking a big gamble on is a good story, some young talent and an algorithm. It bought math. While Yahoo did not disclose the amount of the deal, Kara Swisher of All Things D told NPR's Jeff Brady that it was "about $30 million ... 90 percent in cash and 10 percent in stock." She says the purchase is part of the restructuring under new CEO Marissa Mayer and her plan to bolster Yahoo's mobile efforts. Increasingly, technologies, like finance, and, in Summly's case, news aggregation, are becoming algorithm based; an algorithm simply being a set of step-by-step instructions to produce an output. So could these algorithms, math essentially, be the next tech bubble? In his TEDx talk, Christopher Steiner, author of Automate This: How Algorithms Came to Rule Our World, said, "The story of the next 20 years is the story of big data and algorithms." Including finance and the tech world, algorithms and algorithmic science is already finding heavy use in medicine, sports and the music industry, Steiner says, and that is only going to increase. "Just how much will we allow algorithms to take over?" Steiner wonders. Part of that might depend on whether other companies follow Yahoo's lead and begin doling out large payouts for algorithms that solve their problems. One can posit a future in which computer science and math students simply create and sell algorithms, and not products, to the highest bidder. Why go through the trouble of bringing an app to market when you can just sell the science? During the dot-com bubble, you saw companies pouring huge amounts of money into unproven websites of all stripes, based on the hype of the Internet boom. Many of those sites failed, and companies lost billions. As we saw in the "Flash Crash" of 2010, algorithms can also fail to huge consequences. As we increasingly integrate these algorithms into things that drive our daily lives, failures are inevitable. "It's tempting to view all that acquisition and IPO activity and think, 'bubble.' But a true tech bubble occurs only when irrationality takes over, and otherwise-sane investors start pouring fortunes into, say, Websites that specialize in pet accessories. While much of the current activity appears bubbly, many of the companies shelling out the billions also boast solid fundamentals: nobody is going to confuse Google, Apple, or Amazon with Pets.com. Even Facebook, which saw its stock price tumble from its IPO heights, still makes money thanks to a viable corporate strategy." OK, so perhaps we're not quite there yet, and computer science students shouldn't start planning how they will spend their millions when they sell that sweet new algorithm written in grease pencil on their window. But as technology moves forward, and companies spend millions on increasingly intangible "products" in the hope that it will pay off down the line, you have to wonder if that bubble is lurking just below the surface.